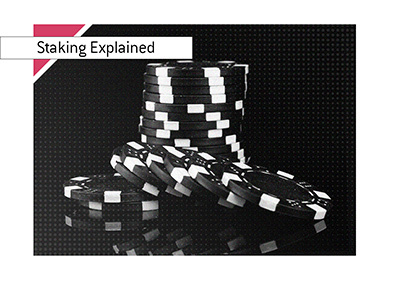 Staking deals are everywhere in the poker world, from people playing on stakes in the lowest level cash games to some of the most recognizable poker players in the world being staked to play big buy-in tournaments. There is plenty of variance in the poker world, and many players simply don't have the financial planning skills to deal with inevitable downswings. For this reason, many players choose (or have it as their only choice) to enter into staking deals, where there is no downside but the upside is shared. Let's say that you have a well-known tournament poker player that has a tough time managing their finances. They have some tremendous lifetime tournament results, though they are always broke due to an addition to sports betting. A player like this would likely be playing under a staking deal. Somebody with a great deal of money might approach a player like this and propose a 50/50 staking deal with makeup. Under the terms of the deal, the backer would enter the player (their "horse") into $10,000 buy-in tournaments. The horse would not pay any of this entry fee, though they would agree to give up 50% of their winnings (after the buy-in is deducted) to their backer. Let's say that the two parties agree to a backing deal that will last for a full year. After five unsuccessful $10,000 tournaments, the horse cashes for $25,000 in their sixth $10,000 event under the backing deal. So, the horse would walk away with $7,500 (half of the $15,000 profit from the sixth tournament), right? The answer: no. Let's talk about makeup now. Makeup means that the horse needs to work off previous losses before they start getting paid any profit. So, in the example listed above, the backer has contributed $60,000 in buy-ins, and there has been $25,000 in total cashes. In this case, the horse is $35,000 in makeup, which means that he needs to make a profit of $35,000 before he will start receiving his 50/50 cut. So, let's say that the horse enters a $10,000 tournament and binks a big $1,000,000 score. There would be $990,000 in total profit, minus the $35,000 in makeup that the horse "owes". So, in this case, the backer and the horse would split $955,000. How do staking deals end? In some cases, there is a big score and the horse decides that they now have the bankroll to buy themselves into tournaments. In some cases, the backer will end the agreement due to heavy losses. In some cases, the backer and horse will mutually decide to part ways. In some cases, the horse will simply stop playing. A horse deciding to play under a different staking deal in this circumstance would be considered extremely unethical and would likely be called out to the poker community. In most cases, the backer will decide to end the deal due to unsatisfactory results. The backer is taking all of the risk in the deal, and they will likely not tolerate subpar results for an extended period of time. Staking deals are rampant throughout the poker world - in fact, there are "stables" where dozens of players might be staked under one person or company. In fact, your favourite players that are regulars on the tournament circuit may very well be under staking deals.